Wiring within the walls is complete! 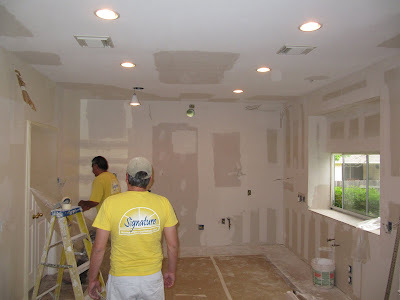 Everything has been sealed up, and the contractors are getting ready to texture the ceiling and the small amount of wall showing along the cabinets, mostly near the door and window. Look at those six recessed lights, one still dangling! My personal favorite is the hole in the top center of the far wall, the opening for a real ventilation hood! It cost $300 to retrofit, so I'm sure the builder must have saved $100 max by not putting that in thirteen years ago. Just one of many cheap cuts that I don't understand. The light over my sink is now centered. Although I assumed there must have been a stud that forced it off center, it appears there was no reason for it to be 3" to the right. Probably a contractor saved 2 minutes by not measuring back when. Instead they put in a spot light that could be angled to fix the issue. I've wanted a pendant there for years, but couldn't do it because then it would be obvious that it wasn't centered. Another excitement: the wall switch for the disposal is gone, to be replaced with an air switch on the counter next to the faucet. No more walking to the side of that 6 foot window, or leaning way over, to clear the sink.